Are you planning an adult-only Disney trip? Check out my activities for adults at Disney World, five tips to guarantee a good time! I know a lot of people think that Disney vacations are just for kids, but they are so wrong. Disney is for adults to! Chris and I have been going since 2009 together and we have always found something that we love to do together. 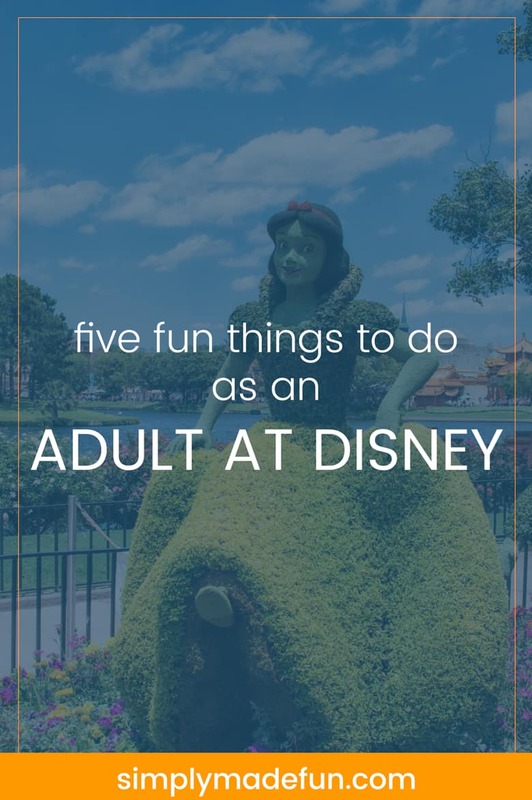 While Disney is definitely geared towards families it doesn’t meant that there aren’t any activities for adults at Disney, because there are plenty! Chris and I loved taking advantage of all the activities for adults at Disney because we know now we have a kid the trips will no longer be just ours. That’s why, before kids, we soaked up all the adult Disney fun we could handle! Sometimes, I miss the carefree days of getting up late, drinking around the world at Epcot, and staying out late. Which are some of the activities for adults at Disney World that I think you need to experience for yourself! Want to know the five activities for adults at Disney that I think you should do? Keep reading! On select nights one of the four Disney parks is open later than normal. During these Extra Magic Hours you can get on your favorite rides with little to no wait time and wander through a somewhat empty park. Night time at Disney is definitely my favorite time to be at the parks because of how beautiful, quiet, and lit up the parks are. **These hours will change depending on the season, so check before you go! Every few trips or so Chris and I treat ourselves to a nice dinner at Disney. It’s a nice change from all the quick-dinning options that we normally have when we are at the parks. It also gives us a chance to dress up and have a nice date night out. Personally, we love Portobello’s at Disney Springs when we’re in the mood for Italian (we went there after we got engaged and for our wedding dinner with family! ), because we can eat and then enjoy the nightlife atafter. Another restaurant on our bucket list is California Grill which is located on top of the Contemporary Resort. Rumor has it that it’s the perfect place to watch the Magic Kingdom fireworks, and I really want to experience it for myself! As a kid I hated Epcot. I thought it was the most boring park and never could figure out why others seemed to like it so much. As an adult though, I get it. Chris and I love walking around World Showcase and buying drinks and food from all the countries to sample. 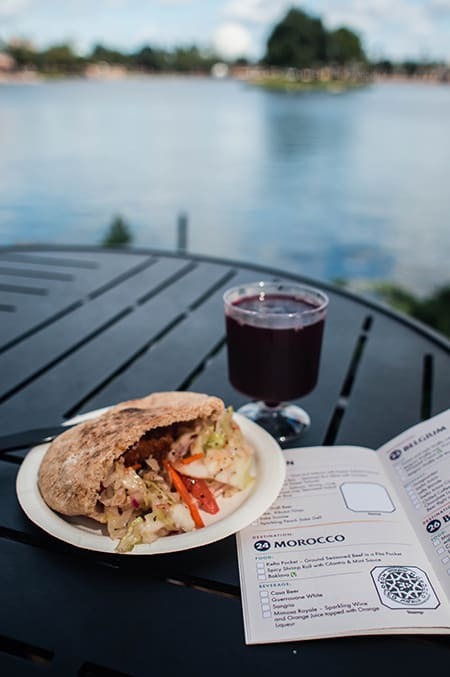 And if you go during the Fall you’ll be able to sample even more food and drinks than you would during any other time of the year! We love to head over to Disney Springs and the Boardwalk on our Disney trips! Both places offer great food, nightlife, and shopping! 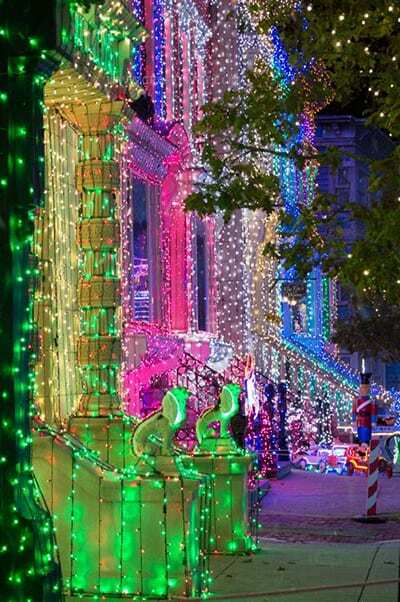 They’re also open late so you can take advantage of them after the parks close for the evening. We very much prefer Downtown Disney to the Boardwalk, but the advantage to the Boardwalk is that (if you’re staying at a resort in that area) you don’t have to go far to get home. If you’re going on an adult trip, stay in a resort that isn’t decked out with Disney characters! Not that there is anything wrong with that, because Chris and I stay in those types of resorts 99% of the time, but this would be a great time to stay at one of the Deluxe or Moderate Resorts you’ve had your eye on. We recently stayed on the Boardwalk and it was a great experience! Don’t forget to visit the spa(s), Senses, at the Grand Floridian and Saratoga Springs! You can get manicures and/or pedicures, massages, and numerous other treatments. What a great way to treat yourself and a nice way to relax after a day of walking around the parks! Plus, who doesn’t want a little “me” time every once in a while! Do you have any favorite adult things to do while at Disney? Did I miss something on my list? Let me know in the comment section below! Check out more Disney related posts to help you plan your vacation! That is awesome! Our family and friends think we’re crazy too, but it’s so fun to just let loose and act like a silly kid from time to time. I hope you get to go back and experience it again soon! Oh I would LOVE to take an adults only trip to DW! Thanks so much for the info. You’re welcome Ashley!! I hope you get to do it at some point. It is so much fun! I travel all over and Disney is still one of my favorite vacations! Now that I am older when I go with my boyfriend we enjoy it so much! Disney as an adult is great. I agree, Tianna! It’s definitely different from going when I was a kid but it’s still just as much fun. I’m glad you and your boyfriend get to experience it together! My husband and I did a lot of traveling when we were dating and Disney holds some of my favorite memories from that time! Years ago I worked for Disney Cruise Line and one of our perks was free entrance to the parks. I loved to “drink around the world” at Epcot! What a fun experience. I’ll be visiting WDW again this coming summer (for free, thanks to my home-based business), and I can’t wait to do this again with my girlfriends! Thanks for your post, some great ideas.